On a chilly day in December, a group of people gathered in a grass field in downtown Seoul to practice what was one of the most sought-after pastimes in the Joseon era: archery. After notching their arrows, the archers stood aimed at a target about 150 meters away. Only silence dominated the freezing wind blowing through the range. They let out their breath as in few seconds, one arrow was fired from a seasoned archer who has been practicing for 10 years. With a buzzing sound cutting across the chilly air, the arrow hit the target. 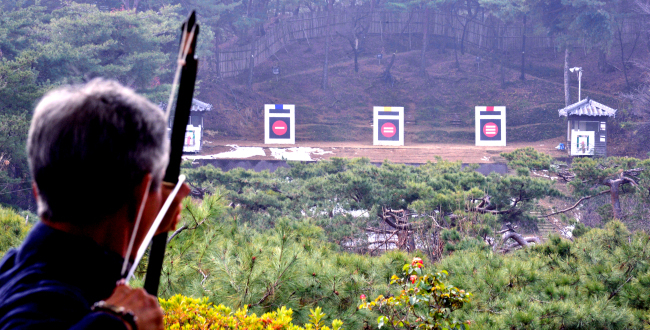 Established in the early 17th century, Seokhojung is the oldest civilian shooting range in South Korea. In 2015, Seoul Metropolitan Government renovated the site to offer a better environment for the citizens to practice their ancestors’ pastime. Korea’s military use of bows and arrows dates to the 5th century BC, when its archers shot from horseback. The bow remained the country’s main long-range weapon until Japanese invasions of the late 16th century.